The Tsomgo Lake also known as the Chhangu Lake in local parlance, is a small beautiful lake situated at an altitude of 12,400 feet. Surrounded by steep mountains on all sides it is a charming sight to watch. The streams from the mountains that rush towards it look like silver streaks from a distance. The photograph on the left shows the NathuLa Business Channel. These are the gates to the famed trade route between India and China. Legendarily known as the Silk Route, this is the only open trade link on the Sino-Indian border. On the left of this gate is India and on the right, China. The single barbed wire fence can also be seen in this picture, dangling down from the platform where we were standing. The picture on the right shows a Chinese soldier shaking hands with children on the Indian side of the border. The barbed wire fence can be seen clearly. The platform on the Indian side is a bit higher from the ground than the Chinese side. This photograph was done in panoramic mode at about 1300 hrs. This provides us with a panoramic view of the Sino-Indian border at Nathu La! Towards the left of those concrete stairs is China. Towards the right is India. You can notice the snow clad Himalayan ranges in China towards extreme left. The blue-capped hut-like structures on the near left of the stairs are the Chinese posts. The one up higher up is a watch post that the Red Army uses to keep a watch on the roads on the Indian side! One Chinese soldier is seen here climbing up to the post on a call from his Major. If you click on this picture and open it up in original size, you will see another Chinese personnel manning the watch post. Towards the right of the stairs that fortified wall like structure is the Indian army bunkers and posts. Just as we started our final climb up to the Nathu La, it started snowing. At first it was a slight drizzle, then rain and then snow. It made our trip worth it. Who would have expected snow here in the summer of May! However, not all was covered in snow, as most of it had already melted during this summer. There were a few patches of snow here and there which were the last remains of the snow that had covered the entire area last winter. Jaishree didn’t waste a single moment to find the biggest chunk of snow and dashed for it. 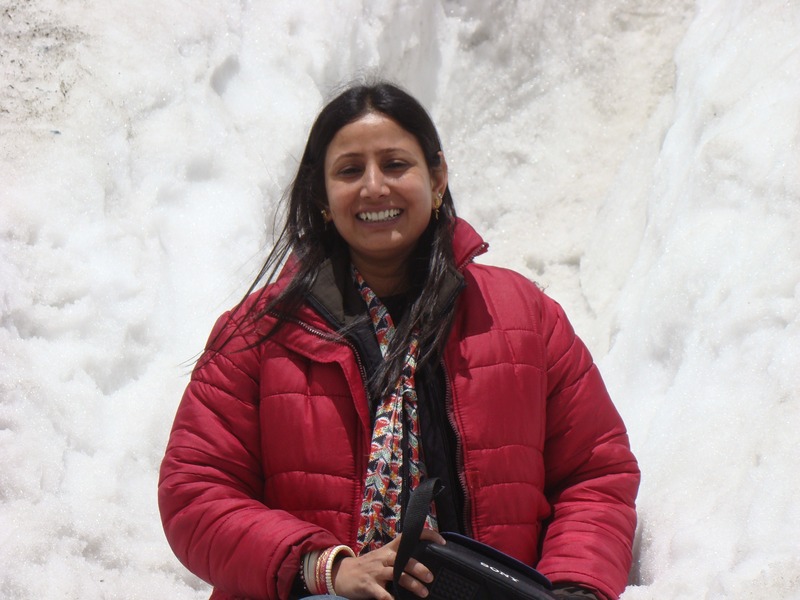 This photograph shows her on top of a huge rock of ice at Nathu La. Mera Bharat Mahan, Hum Hi Jitenge! 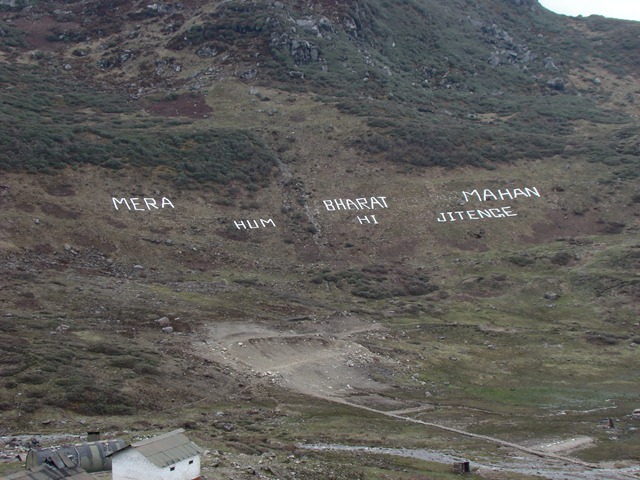 While climbing up to Nathu La, we encountered this motif drawn on the hill slopes so that it is clearly visible from the snake like winding road that leads to the frontier. This is the handiwork of the Indian Army personnel. At this height of 14,000 feet, the vegetation is meagre and the mountains look barren. Even at the fag end of May, the peak of summer the temperature is 4 degrees celsius! We woke up early today, in anticipation of good weather and clear view of the Kanchenjunga ranges. Weather did improve but clouds and mist persisted and our remaining hopes dwindled! However, our tour manager, Gyatso came with a good news… our permits for Nathu La got cleared for today. And so there we were, moving out of Gangtok by 0800 hrs for a drive that would take us a little over 3 hours. We had Sachin for our driver today as he is a regular on this stretch of the road. We cruised only for a little distance when the road started getting narrower and ill-maintained. Perhaps more so because of the heavy rains until a couple of days before. As we started climbing up, the climate got pleasant. A welcome turn from the humid and warm Gangtok that we left behind. The landscape of the valleys were more or less similar to those we saw in Teesta valley not so long ago. Only until we reached the Tsomgo Lake at 12,500 ft. Also, called the Chhangu Lake in local parlance. A rather smallish but beautiful lake in the middle of nowhere took us for a pleasant surprise. Not that we weren’t expecting it, but seeing it first hand was another experience altogether. Clear hazel water was calm and smooth. This lake collects its water from the melting snow in summers from the peaks above. This time it had perhaps collected more water from the continuous rains in yesterdays. During winters, it gets frozen on the surface. What a spectacular sight that would be! We were consciously careful as the air gets thinner and breathing problems hamper the zeal at such heights. But, we didn’t feel a thing even at Nathu La higher up there. Yes, we did start panting even after a little brisk walk or climb but not that bad. We didn’t stop at Tsomgo, as we had to reach Nathu La as fast as possible, timings being the reason. We further climbed upto 14,400 feet winding thru the narrow roads with steep ascents. The mountains started getting brown because there is little vegetation in lower temperatures. By the time we reached the army helipad (where all vehicles are made to wait as the army personnel manage visitors in batches for Nathu La) we were already shivering. We had to put on the jackets which we hired at Tsomgo specifically for this purpose. Once our batch was cleared, an army personnel escorted us in our cab to the final peak i.e. 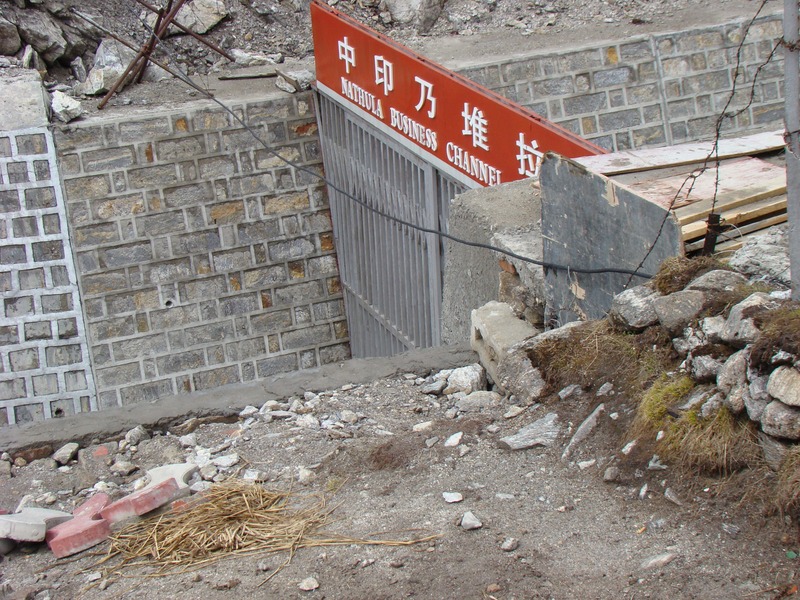 the Sino-Indian border. The moment we started our ascent to the border, it started snowing! Wow, snowfall in late May! It was a 5 minute climb to the border. And when we finally reached the frontier it was a different feeling that overcame us. Being at the only open link between India and China was a feeling that kept us awestruck. 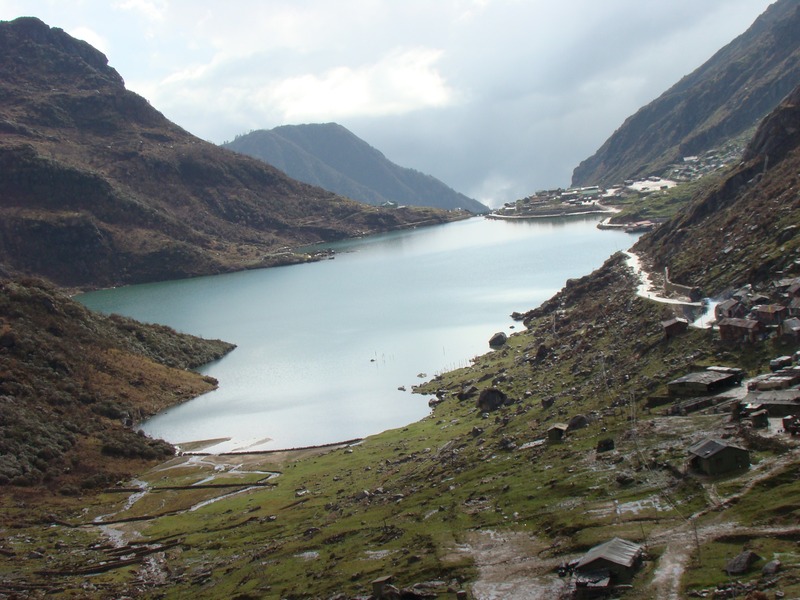 Nathu La is a lepcha word which means “the pass of the listening ear”. It is that legendary silk route between India and China, and is still the only trade link on the Sino-India border that is open. There were patches of snow at this time of the year and Jaishree had her heart’s fill of fun playing with those small patches. The border is demarcated by a single fence of barbed wire at knee height. On the chinese side, construction work was on for some convention centre by the Chinese. There were a couple of Red Army personnel at the border who were as busy taking pictures of Indian tourists as the Indian tourists were taking theirs. Initially they were reluctant to come even near and just nodded from a distance. But, after repeated requests from several Indian tourists, they finally came closer, shook hands and posed for photographs. Jaishree shook hands with one of them and even chatted for a while with another one. The Red Army personnel do not usually utter a single word, but sometimes they do respond hellos and byes. 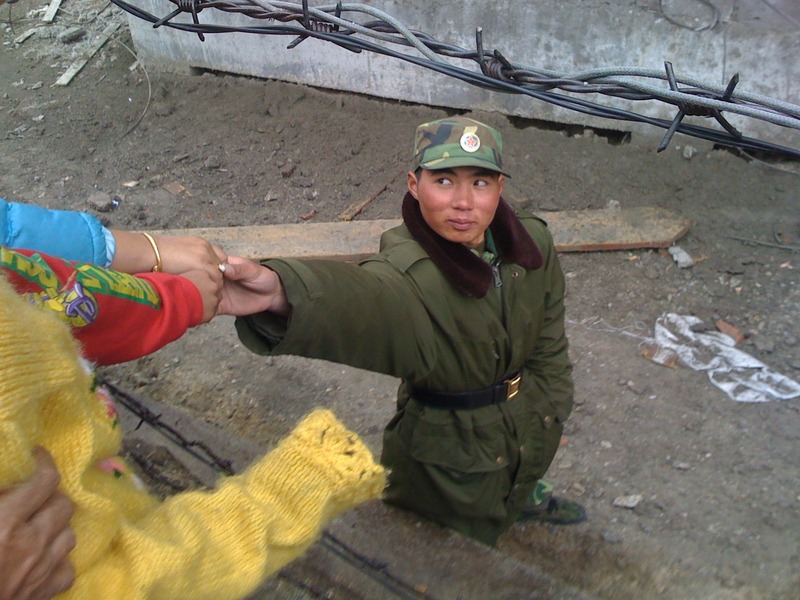 And this sino-tibettan army man exchanged hellos and thank yous with Jaishree and posed for a couple of photographs. I had already started feeling very cold, the temperature here was 3 to 4 degrees celsius and I got myself completely wrapped in a jacket and with muffler over my ears and the hood tightly over the head! We could help remember the 45 degree heat at Delhi we had until a few days before! After a while we drove down to Baba Harbhajan Singh mandir. Baba was an Indian Army personnel and went missing during the Indo-China war of 1962. This mandir was made by the armymen when he appeared in their dreams. Until a few years ago, this mandir was maintained by the Indian Army and they used to organise a lunch and prayer every week. The lunches were later discontinued and now it is maintained by AWWA. We didn’t stay long here, and after a cup of coffee drove down back to the Tsomgo lake for lunch. Jaishree tried nearly everything a small shack had to offer! From dimpsums to chowmin to egg-rice, everything! Drive back to Gangtok was another 3 to 4 hours during which Jaishree dozed off and me was busy taking pictures on the way. Every once in a while Jaishree would wake up, enjoy the beautiful valleys and then doze off again. We were feeling tired. By the time we reached back our hotel at Gangtok, it was nearly 8 in the evening. We have had our dinner early and now retiring to bed. See you tomorrow.